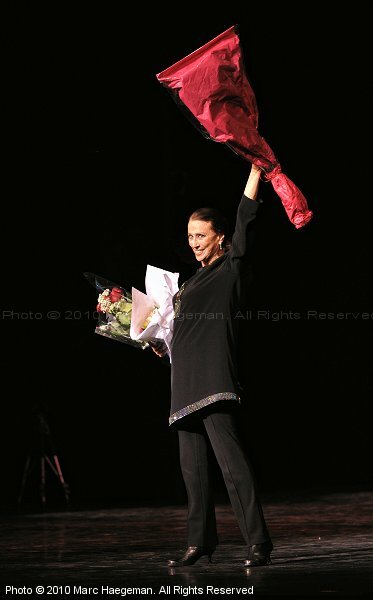 Homage to Maya Plisetskaya, prima ballerina assoluta turning 85. Gala evening hosted by the Maris Liepa Foundation at the Paris Théâtre des Champs-Elysées, 6 December 2010. Guests included Maria Alexandrova, Ilze Liepa, Mikhail Lobukhin, Andrei Merkuriev, Nikolai Tsiskaridze (Bolshoi Ballet), Alexandra Timofeyeva (Kremlin Ballet), Andrei Batalov (Mariinsky Ballet), Semyon Chudin (Stanislavsky Ballet), Ludmilla Konovalova (Vienna State Ballet), Ludmila Pagliero and Christophe Duquenne (Paris Opera Ballet). With special thanks to Richard Stéphant/Sherwood Productions and Franck Peyrinaud. Copyright © 2010 by Marc Haegeman. All rights reserved. Copyright © 2000-2010. All rights reserved.